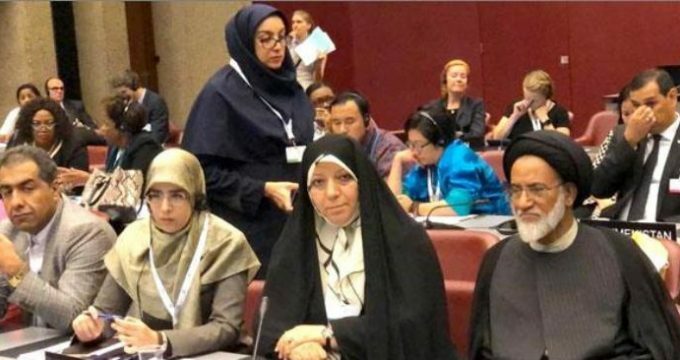 IRNA – Majlis (Iranian Parliament) is trying to pass the necessary laws to boost women’s conditions and empowering them as a major factor in sustainable development, said a female member of parliament during the Inter-Parliamentarian Union (IPU) meeting in Geneva. ‘Promoting women’s rights and dignity and empowering them are the prerequisites for development in any society,’ said Parvaneh Mafi on Sunday. ‘Discovering and supporting scientific elites, especially women researchers, commenced in Iran’s National Elites Foundation a decade ago,’ Mafi said. ‘Nowadays, Iranian girls form a significant part of the scientific festivals and Olympiads,’ she added. She went on to refer to the large population of Iranian female university students in Iran. The 139th Assembly of the IPU is taking place in Geneva, Switzerland on 14-18 October. All IPU statutory bodies, including the Governing Council, Standing Committees, Committees on the Human Rights of Parliamentarians and on Middle East Questions, as well as the Forum of Women Parliamentarians and the Forum of Young MPs, will meet on this occasion, wrote the IPU official website.